Fr. Sweeney remains were taken nearby Burrishoole Abbey, where he was buried with his parents. In 1922 a monument was erected to the memory of the Patriot Priest. 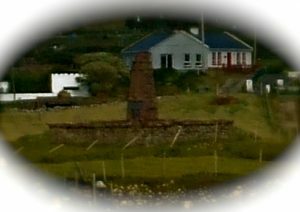 He was not forgotten at his birthplace of Achill, when in 1944 Emily, Anita and Eva with the help of a committee and the islanders erected a monument too. This entry was posted in Friends, History, Places on November 29, 2016 by Maria.